The dashboard lets you view all the website analytics and statistics. Updated in real-time, the dashboard can be customized at your convenience: How to customize the dashboard and the widgets? The calendar lets you define the report date. 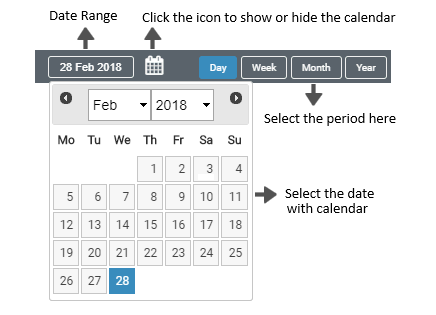 You can select or change the date range by selecting a period: Day, Week, Month or Year. Click on the calendar icon to show or hide the entire calendar. The gauges measure your traffic for the defined period. You can select the measure units: visits, pages view or unique visitors. 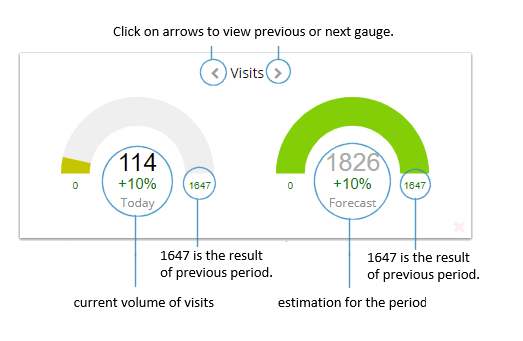 The first gauge shows the number of the current visits, P.V. or unique visitors for the defined period. The second gauge indicates the number of visits, page views, or unique visitors your might get on your site for the entire period. It is an estimate according to the visits, page views and unique visitors received since the beginning of the period. 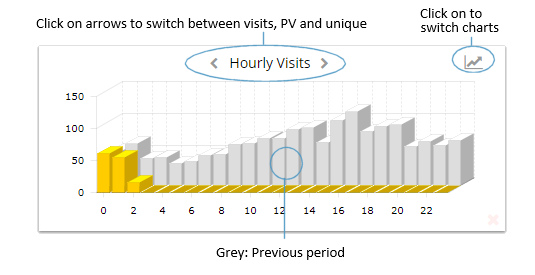 The main chart shows the detail of the visits, P.V., or visitors. You can switch between line and 3D charts by clicking on the chart icon. 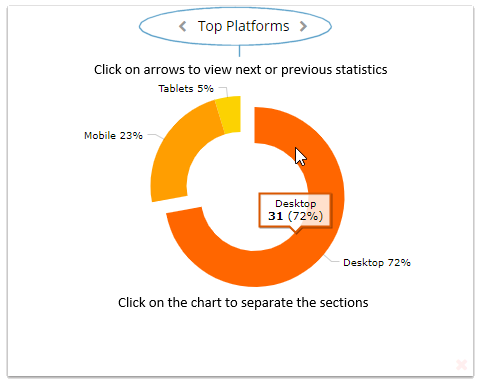 You can hover your mouse cursor over the chart dots or columns to see more details. You can zoom the chart by selecting an area with your mouse. Click on the chart, hold the button down and move the cursor to select the area to expand the view. This is a rolling chart. You can see the following reports: Top platforms, Top sources, new vs returning visitors, Top search engines. You can move your mouse on the chart to see detail. Click on the chart to separate the different sections. The Widgets Manager allows you to add and remove Widgets. You can set your Dashboard preferences and restore the original layout and widgets. The Widgets Manager appears when you click on the wrench icon located next to the date. Add Widgets to your Dashboard. Select a Widget from the drop-down menu and click on the add button. The Widget will be added to the Widgets list. Delete Widget from your Dashboard. Just click on the Widget name inside the Widgets list. The Widget will be removed from the list. Note: Once your work is finished, make sure to save your changes by clicking on the “Save and Update” button. Show a menu with choices of multiple reports. Enable/disable content scrolling via mouse-wheel. Maximize the windows: Open a modal window with navigation options. Full screen option: Display the content in full-screen mode.